Perspectives on the next recession | Asset TV U.S. When will the next U.S. recession hit, and what will trigger it? Here to provide answers — as well as insights from past recessions — are economists Darrell Spence and Jared Franz and portfolio manager Joyce Gordon. Please click here to view the white paper. Will McKenna: Today we're going to delve into the complex and often misunderstood realm of recessions. Now, if you're wondering why we decided to tackle this subject, the idea really came from you in our audience. So, with that in mind, we decided to seek out some of the brightest minds at Capital on this topic and provide perspective — not predictions — into the difficult but inevitable periods of contraction in the U.S. economic cycle. So, here’s what you’re going to learn in this episode. We'll discuss the relative impact of recessions compared to expansions; the key events that have triggered past downturns; what signals to watch out for, for the next recession; and then the steps that investors can take to prepare their portfolios for the next one, whenever it hits. Now, before I introduce our three panelists today, I want to say a couple words about an exciting new feature we're introducing with this program. It's our free Guide to Recessions e-book. That's a companion piece, if you will, to today's discussion. And I'll say more about that later. So, now without further ado, I want to introduce our three panelists. With me today are economists Darrell Spence and Jared Franz, who both cover the U.S. economy. Darrell has 26 years of investment experience, all with Capital Group. Jared has 13 years of experience and four with Capital. And today we also have a very special guest: Joyce Gordon, who's a portfolio manager, who invests primarily in dividend-oriented stocks — those kind of stocks that have historically tended to hold up relatively better during times of economic distress. Joyce has been with Capital for 43 years. She is the principal investment officer of American Mutual Fund®, or what we call AMF. And let me just apologize to our listeners outside the U.S.: American Funds are not available outside the United States. So, welcome, everybody. Appreciate you joining us. And let's jump right into it. Darrell, I'm going to start with you and throw you a real softball. When exactly is the next recession going to start? Darrell Spence: Well, that's a good question, Will. And maybe the best answer I can provide is that it's closer than it was yesterday but further away than it will be tomorrow. Look, I think one thing that is now somewhat common knowledge, but wasn't even as short as a year ago, is that recessions aren't dictated by how much time an economy has spent in an expansion. Darrell Spence: So, the average expansion has lasted 60 months, just over five years. And as of July, we'll be at 10 years. So, I want to give you a bit of a different way to think about how long this expansion has been, that goes just a little bit beyond the amount of time that's passed. So, in an average expansion, the economy grows to about 123% of the prior peak, in terms of real GDP. Right now we're at 119% of the prior peak. So, even though the expansion has been twice as long as the average, we still haven't even covered as much ground, in terms of economic growth, as we have in the average expansions of the past. So, that's kind of a complicated way to say we've been growing fairly slowly since coming out of the last recession. But recessions are really about imbalances that build up in the system that need to be corrected. And you ultimately get late in the cycle and you enter into a Fed tightening phase or inflation starts to pick up. Or maybe even inventories get built up too rapidly. And something happens that triggers these imbalances, that ultimately cause the economy to turn down. You know, we can't lie: We are late in the cycle. You have an unemployment rate that is arguably well below what most would consider the natural rate of unemployment. You're seeing the symptoms of that in rising wages. You're starting to see somewhat higher inflation; it's gradual but it has been moving higher over the past couple of years. And you have a Fed that, until recently, was in a tightening cycle. And we think the odds are more likely that they return to that tightening cycle than they go back into an easing cycle as we go through the remainder of 2019. And all of those things have generally been precursors to recessions. If we look at things like where the unemployment rate is, when did the Fed start this tightening cycle, what is inflation doing, and we look out at some of the things we see that might be imbalances in the corporate debt markets or leveraged loan markets, our best guess on when we might get a recession as all of this plays out is starting sometime in 2020 or maybe 2021. But again, there's a lot of uncertainty in that. A lot of it depends on whether the Fed restarts the tightening cycle, whether inflation continues to move up, as we suspect it will. But based on our analysis of history, where we are now, our conversations with analysts about where we see excesses in the system, that's our best guess. Will McKenna: OK, great. So, not imminent but watching some of those imbalances. And what's interesting is it can be different things in different recessions that trigger different recessions. We'll come back to that. You know, Jared, one of the things you've been putting together for us for the last couple years is this great chart that shows where we are relative to some of the other large developed and also emerging countries around the world. Talk a little bit about that: where you see us in the cycle, maybe relative to some of the other big economies out there. Jared Franz: Yeah. I think, as Darrell pointed out, we do think we're late cycle. And we tend to divide the cycle into four parts: the expansion, the mid-cycle, the late cycle and then the inevitable recession. So, we think we're just entering that late cycle. The late cycles are interesting because there's no pattern. The average is, let's say, around nine months, maybe 12 months. But we've had late cycles that have lasted much longer, two years, as in the late '90s. And so, we're thinking about what are the dynamics of this late cycle? How could it be different from other cycles? And so, to Darrell's point, it's not that we're predicting a downturn based on some type of formula. But we're looking at the dynamics. When you look at the U.S. relative to other countries, we were ground zero of the crisis in '08 and '09. And then, we came out of it very quickly, through monetary policy, fiscal policy, recognizing losses on portfolios. We were able to come out of that recession relatively early. And then it was kind of the domino effect of the rest of the countries following us. Right? And so you had Europe later; Japan, other countries following us by about a year or two. So, as a result, we've been progressing slowly along this cycle. So, we were the first to hit the cycle dynamics that we've been talking about. And now we have other countries like Europe — within Europe, countries like Germany — Japan, even China is looking more like a late-cycle economy. And so, now we're saying, “Oh, well, the risks to the outlook are definitely more to the downside, to the extent that we are in this late cycle.” And the late cycle is not saying that we're going to enter a recession. It just says that the expansion is older. It's a little weaker than it has been in the past, and we don't have those kind of strong mid-cycle dynamics that we used to back in '15 and '16 or even earlier. Will McKenna: Got it. So, late-cycle clock starts ticking a little bit. But it can run to different lengths. I do want to return to this idea of why you guys are seeing it maybe out a little bit from here and what are the imbalances that are starting to creep up. But before I do that, Joyce let's bring you in. Would love to hear … you've done this for a few years. You've managed money through a number of economic declines, and I'm sure bear markets as well. How do you think about positioning your own portfolio — the ones that you manage in the funds you manage? And are you doing anything differently now, or is this anything you're concerned about at the moment? Joyce Gordon: Yes. You know, since we are in the late stages of the cycle, what we see is a very strong employment picture, with a very low unemployment rate. We start to see wages move up. And it's at a time when order rates at companies start to come down a little bit or at least level off. And so it makes the prospects of an earnings surprise, or an earnings miss, more likely. So, you end up with more volatility in the market. When I think about the volatility in the market, there still is a lot of room for the market to go up. Because, as Darrell and Jared mentioned, the recovery could go on for a long period of time. Joyce Gordon: But I want to be prepared, and so I try to invest in companies that have lower leverage, so they don't have as much debt to repay if earnings suffer a little bit. I try to invest in the companies that are very solid, and also the ones that have a pretty solid revenue stream, even if we go into recession. I’m thinking about the utility companies. About food retailers, defense contractors, health care companies and even some real estate investment trusts. And you want to be very careful of investing in companies that are involved in areas of discretionary spending. It could be auto sales or anything related to travel, be it airlines or hotels. And then also financial companies. Banks make loans, and when you go into recession, a lot of those loans go bad. And so, you have rise in credit losses. So, it's prudent to stay away from some of those if you really think a recession is coming at some point. But it really comes down to doing the research on companies — one by one, out seeing companies, talking to managements, seeing what the order trends are. And then we have this backdrop of what typically happens during a recession and which companies typically do better. And that's helpful. Will McKenna: That's great. And those classic defensive areas that you were talking about. Let me follow up and talk a little bit about 2008 and the Great Recession. Will McKenna: I think [it’s] still very much on the minds of our audience. When we look at the questions we get, people were really so scarred by that. That's kind of the anchor or the framework they bring to thinking about recessions today. Will McKenna: — so to speak. But there were a handful of companies — Amgen, Hasbro, McDonald's, Walmart, those types of companies — that were positive that year. What lessons did you pull from that period in particular? Joyce Gordon: Even going back to the 1987 big decline in the market, what was true of both of those time frames was, you wanted to avoid companies with a lot of leverage. Companies with a lot of debt service that they have to deal with are subject to problems of outside influences, of credit rating agencies that force their hand and make them cut their dividend, so that they can maintain investment grade. And that would hurt the stock price if they cut the dividend at a time when you're going through the problems. That was one big thing I learned. Another thing I learned was to really pay attention to what people are doing. And, you know, going into the Great Recession, we had the Sandlers, who owned Golden West Financial in California. And this was their baby. This was their savings and loan company, that they built. And I thought they would never sell it. Right before the peak, they sold it to a bank. And I think that I should've paid more attention to that — that they were nervous about mortgages. And they were nervous about the state of the bank. And another thing that happened back then was Washington Mutual Savings Bank, based in Seattle. They issued a proxy proposal that would change the management bonus structure and take out any loan losses from the impact from the management incentive plan, so that they were being incentivized by volume, not quality. And that was another telltale sign that something horrible was coming. And so as I look around now, I don't see a lot of those types of things going on. But what I do see is some companies that have typically increased their dividend every single year, over this last year [they] have not. And the ones that have not are the ones with a lot of leverage. And so they're kind of worried about paying down their debt and not increasing the dividend. And we're seeing that with some of the food companies. And so, that confirms that we're in the later stages of the cycle, and that sales growth is tougher and that companies are focusing on paying down debt. Will McKenna: — and you know, in hindsight, could've been those early warning signals. Will McKenna: That's great. You guys were talking about some of the different imbalances, and maybe in different recessions, there are different ones. Talk a little bit more about that, Darrell, in terms of what you guys may be seeing today in those imbalances. And then, compare and contrast that to some of the other recessions you've studied through the history we've looked at. Darrell Spence: Yeah. Well, it was noted before, what ultimately pushes the economy into a recession can differ. But there's somewhat of a difference between a catalyst for a recession and then what we would call an accelerant. The catalyst causes the economy to slow; maybe it's not the reason that growth actually turns negative. But then there's the accelerant that ultimately comes in and really causes a lot of problems. So, right now the most likely catalyst is something that's pretty traditional. We thought it would be an ongoing Fed tightening cycle. And the accelerant would be a lot of the stuff that's happening in the corporate debt market. So, Joyce has already alluded to a lot of the leverage that's out there. But some of the top-down accounting research we've done shows that, almost as aggressively as they were in the late 1990s, firms have been borrowing not to basically fund productive capital expenditures, but to do stock buybacks; to pay dividends; to do M&A; and basically, in some cases, financial engineering, which makes their balance sheets look a lot healthier. It makes their earnings look a lot healthier. And this is not every company, obviously, but there are some that have been more aggressive about it than others. And that's fine, as long as rates remain low or the lending markets are willing to continue to lend money to you. If one or both of those things changes, those business models start to fall apart. You can start to see those companies get into trouble. Maybe they start to lay off some people. Maybe they don't do a capex plan that they had planned on doing. And you can see how that can start to spiral through the system. So, right now, I think that is probably where we see the greatest imbalance. And again it's not across every single company that's out there. But the numbers in aggregate have grown to a size that we think it's something that we need to keep a pretty close eye on. Will McKenna: Right. And, to your initial comments, why 2020? Why 2021? What's leading you to think that that's the time frame we're looking at? Darrell Spence: Well, a lot of it has to do with inflation picking up, the economy at full employment and the Fed continuing on a tightening cycle — which, over the past couple of weeks, now seems to be a little bit in doubt. We think the Fed is definitely in wait-and-see mode. But we think ultimately, economic conditions will probably bring them back into a tightening mode — not an aggressive one, but a tightening mode. But admittedly, they're in kind of a sweet spot right now. They've achieved full employment. Inflation certainly isn't a problem, even though it's right at about, or slightly above, their target, depending on what measure you look at. The question is whether that balance can last. And history suggests that it's very difficult to maintain this balance at this stage of the economic cycle with this amount of resource utilization, whether it be labor market utilization or capacity utilization in the economy. But, you know, that is the one thing: that if for some reason we don't see inflation percolate up a little bit more and the Fed doesn't get back into the game, we still think these imbalances will have to be dealt with at some point. But the catalyst that ultimately sets off those as accelerants, maybe that's 2021, instead of 2020. Will McKenna: Got it. I know one of the things that you guys put together in this guide is a comparison of recessions and expansions. And this was very eye-opening for me. But Jared, maybe you can talk to this point — and when we studied these cycles back to, I guess, 1950, looking at recessions — and put them in perspective relative to expansions for us. Jared Franz: Sure. So, I think, hopefully, what people take away from the chart is that the economy is overwhelmingly not in recession. And so, the typical state of the economy is in an expansionary period. As Darrell pointed out earlier, we do have imbalances that crop up. And this is part of human nature and the psychology of markets, that you go into tech in the '90s, you go into housing in the last cycle, maybe it's corporate debt in this cycle. And so there tends to be an overshoot in these imbalances. And so, the variety of recessions that we've gotten in the last two, and what we expect for this one, is likely in this imbalance category. And that differs from prior recessions. So, in the '40s and '50s, those recessions were very different. If you think about the economy in those time periods, there wasn't a big tech sector. It was very manufacturing-based. And so, you'd get these inventory-cycle type recessions where manufacturers would discover that they had way too much inventory. And they had to cut inventories, and production would go down. And that would cause these cycles earlier on. We're not there anymore. And that really makes it difficult for the timing, because you could calibrate an inventory cycle, a manufacturing cycle relatively easily. You could see the data. Now you have these kind of imbalances. When does the market start waking up to these imbalances? Your guess is as good as mine. I don't know. But what we’ve found is that, even if you go back to the last cycle with housing ... I remember being in graduate school, and we had a seminar on, “Is the housing cycle a bubble?” In '06, right? This was well before the recession actually happened. Will McKenna: Just how long does it then take to get recognized and burst? Jared Franz:— until someone wakes up in the morning and says, "You know what? This house is actually really expensive relative to my income." And then you have this kind of domino effect. So, I think we're looking at the same type of situation here, where we can kind of point and look at these imbalances. It's hard to figure out where the trigger is, but we do feel like a trigger will come eventually. And whether it's tomorrow or in a year or even farther than that, we're monitoring that. Will McKenna: Got it. And we'll get into some of the signals you guys watch closely. Will McKenna: Joyce, I want to come back to you. Let me just read a couple things off this chart that struck me. “Over the last 65 years, the U.S. has been in official recession less than 15% of all months.” And then, when we compared them, the average expansion is 67 months, while the average recession is 11 months. And just the GDP growth, cumulative growth, 24.3% in an expansion and –1.8% in a recession. Not at all to diminish the real human cost and pain of a recession, but I know when I saw this, it gave me certainly a sense of reassurance. Oh, OK. It took the temperature down thinking about recessions. You know, Joyce, let's talk a little bit about the stock market vis-à-vis recessions. You mentioned some of the types of companies and interesting examples from that period in kind of '07, leading up to '08. Where we sit today, what are the types of companies that you think are well-positioned to weather the next downturn, whenever it occurs? And maybe talk about two or three examples. And of course, these are not ... at Capital Ideas, we do not give specific investment recommendations. But what are the kinds of things that are on your mind there? Joyce Gordon: Well, I think, first and foremost, it's really important to stay invested during this period, because as you say, only 15% of the time we're in recession. And you can get a lot of your appreciation late in the cycle. And no one knows exactly when the cycle's going to hit, so I like to be participating in the market all the way, and then I just adjust a little bit around that. So, the kinds of things that should hold up well would be the utilities in the U.S. And if you pick a plain vanilla utility like American Electric Power, if you go back and look at every decline in the market of 10% or more going back to 1990, we've had 13 instances when the market has declined by 10% or more. And in all 13 cases, American Electric Power did better than the market. It lost value absolute, but relative to the market, it did quite a bit better. Those are the kinds of things that I would look for. And I would also look for companies with solid dividends. And not only just a high dividend, but a sustainable dividend. You want to make sure that through a cycle, that the company will be able to pay that dividend. The worst thing that can happen is you get part way through, and the company has to cut the dividend, and then you lose your support for the stock. And so you lose a lot of value there. Will McKenna: And that's what really happened in the '08, '09 period, wasn't it? Will McKenna: So, how are you taking that experience to what you're thinking about today, and what are the types of companies that you think have the balance sheet strength to make it through? Joyce Gordon: Right. It would be focusing on companies with lower leverage. That's the main one. Focusing on companies that have a pretty good revenue stream, almost regardless of what's going on in the economy. And those would be the utilities. Food retailers tend to do quite well. Costco and Walmart tend to do better than the market in these declines. Even a company like Hormel. They have a decent dividend, around 2%, and they grow that dividend maybe 10%-ish a year. And very low leverage; sometimes they're net cash. And it just holds up quite well. Will McKenna: — with Hormel. You know, it's those kinds of things. Boring is beautiful in this phase. One of the questions we get from the audience is the relationship between the stock market and recessions. The stock market typically is a leading indicator. How long does it roll over ahead of a recession? So, you guys have studied this. What are some of the things we ought to be thinking about relative to stock market and recession? Darrell Spence: — it peaks about six months, on average, before the recession starts. So, of course, trying to figure out when an unknowable event is going to start and then flash back six months from that to implement your portfolio strategy is very difficult. So, as Joyce mentioned, it's probably good just to stay invested. But I think we think about the market from a little bit of a different perspective. The reason recessions aren't good for the stock market is because they're not good for earnings. And ultimately, earnings will go down. How much the stock market goes down along with those earnings really depends on what valuations are, where you start, where you end up. And a lot of that depends on the interest rate environment. So, as we look out, if we know for sure — and we don't — but if we suspect a recession is coming in 2020, it's probably not too early to start thinking about [the] defensive positioning you would do, given these kind of six months, average six-month lead time between the market peaking and the start of a recession. But I think, even if I don't know that a recession is coming, Joyce alluded to some of the late-cycle things that ultimately put downward pressure on profit growth. You have rising labor cost. You have generally slowing top-line growth, often rising interest expense. And all of that comes together to put downward pressure on profit margins. So, 2018 was a fantastic year for profits largely because of a tax cut, but also because of robust economic growth. 2019, we expect, will be a lot more subdued. 2020, if we do start to see more significant economic weakness, it would not surprise us to see earnings go down. And that's in an environment where the market is already arguably fully valued. So, as I look out, recession or no recession, I still think it can be somewhat of a challenging environment, just because I don't expect to get a lot of earnings growth. But if I do have some level of conviction that there is a recession coming, I know earnings are going down. And there's not any type of valuation cushion, at least in our framework, that's going to keep the market from going down along with it. Will McKenna: Well, speaking of, maybe, a more defensive positioning at some point, let's talk about bonds and the role that bonds can play in a portfolio. I know you're not a bond manager, Joyce, but in the chair you sit in, [you] obviously have some perspective on this. But what role should fixed income investments play at this part of the cycle? And how would an investor think about that? Joyce Gordon: Yeah. They can definitely help stabilize a portfolio. Having some bond exposure just helps lower the volatility overall in your portfolio. And even though, if you were thinking that interest rates may rise slightly over time, it still makes it an interesting prospect to invest in bonds. There's a saying that a bad day in the equity market is much worse than a bad day in the bond market, and that bonds move a little bit when stocks move a lot. And so, you really can use them [to] tamper down your volatility, and with some reasonable yield. And I use cash that way, too, actually. Now that cash has a yield of about 2.25%, I do have a fair amount of cash in my portfolios that will act to lower the volatility. And also, I'll have cash available; if the market does correct, I'll be able to get into something else that I want to buy. Will McKenna: And so for you, personally, does that mean 10%? 20%? What's a ballpark sense of what that is in your slice? Joyce Gordon: Yeah. A normal level of cash for me is probably 6% or 7%. And right now in AMF, in American Mutual Fund, I am at about 16%, 17% cash. Joyce Gordon: And it's partly because we are so late in the cycle and I'm getting nervous about valuations. And American Mutual Fund is a unique mutual fund that has preservation of principal in its objectives, so I really try to protect in that fund. And I know I do give up some of the return, but I'm really trying to protect shareholders. In the other places where I manage money, I am more around the 10%-ish cash, which is higher than normal for me, but not off the charts. Will McKenna: So, let me just follow up. Let's get into it a little bit with American Mutual Fund. And again, I need to apologize to our friends outside of the U.S., who can't access the American Funds. You're the PIO on that fund. It is known for seeking resilience in times like this. It sounds like you and your slice of the fund — and of course, we have the multiple manager system, where everybody has a slice — have gotten more defensive. Talk a little bit more and take us a little deeper into that. So, 16% cash. And the types of companies you might hold, have you made changes there? Give us a flavor of that. Joyce Gordon: Yeah. I think all the managers in American Mutual Fund are really looking through their portfolio with a fine-tooth comb, because we know we are later in the cycle now. And as I mentioned earlier, we run this screen on every company in the S&P 500 and look at how it did in each of the downturns of 10% or more going back to 1990. And so, we get the whole array of companies that always do well, typically do well, never do well. And it's a good starting point to start asking questions. It's not that you would buy, make an investment, based on that. But then, based with that knowledge, we can go to the analysts and talk. You know, “Is there anything unique going on at the company that's going to have it behave differently this time?” And we really do try to go through and make sure that we are protecting shareholders. Will McKenna: And I don't know if you are seeing any themes across the managers in the portfolio when you look at the top 20 holdings in the fund. You mentioned as a theme lower leverage. Any other themes that come to the fore as you think about top holdings in the fund? Joyce Gordon: It's interesting. We had a portfolio managers meeting this week for American Mutual Fund. And we look at a lot of different metrics. And we have a lot of different styles of portfolio managers in the fund invested in financials. I think I had the lowest exposure at 3% of the portfolio, but someone else had 20-plus percent in financials. Will McKenna: What was their rationale? Joyce Gordon: Well, they weren't invested so much in traditional banking, but they were focused on areas that don't have the loan-loss problem. So, it could be exchanges and some of the trust banks where they're just doing custody, where they wouldn't have exposure to loan losses. Everyone's doing different things, but we're all focused on the same outcome, [which] is how to participate in the market, have an above-average current yield and protect their principal. Will McKenna: That's great. I love that example. Any others come to mind for you as you think about the variety of styles inside the fund? Joyce Gordon: Some people are very interested in health care, because health care typically holds up extremely well. But we don't know if there are any drug pricing changes that are going to come down, so we have portfolio managers on either side of that argument, where they're concerned about it or they're not. And you can go through each industry, and we have a big variance in opinion around what is attractive. Will McKenna: Interesting. Of course, health care, too. That big innovation cycle that we seem to be going through as well. Will McKenna: OK. Thank you. Now, before we move on, a bit more about our Guide to Recessions e-book, which I mentioned at the outset. Loaded with insightful charts and easy-to-digest analysis, this guide relies on decades of economic and market data to help demystify a complex and often misunderstood subject. So, whether you're an investor looking to make sense of the next market downturn or an advisor in need of a handy reference to share with clients, this e-book is a vital resource we know you'll want to have. And if you need CE credit, our guide gives you the opportunity to earn an hour of continuing education credit for your CFP or CIMA designation. Did I mention that it's free? You can download the e-book using the link on your screen below, or if you prefer, just find it at guidetorecessions.com. Let me come back to you guys now. And I know you've been studying, Jared, for some time the different signals that you guys watch very closely going into a recession, whatever the indicators are. And of course, there are many of them. I know in this guide that you all put together, we pulled out five that we felt were particularly useful tools for us. But talk a little bit about some of the key ones, and what are the ones you're watching, Jared? Jared Franz: Sure. So, there's probably a thousand actual ways to monitor whether we're going into a recession or not. We tried to pick a couple indicators that we thought worked in other cycles. And there's an old quip in economics that “cycle is housing.” And so there's a housing indicator in there. And so, why does that work? Housing, even though it's a small share of the overall economy relative to the consumer or even manufacturing, it punches kind of over its weight in terms of impact, because the tentacles in housing are pretty broad. So, it's the laborers, the person who buys the house, the leverage that's involved in housing. And so it has much broader impact than just buying that house. And so the housing indicator is one. If that's falling by at least 10 or 15%, then that tends to be a good indicator that the economy's starting to lose momentum, lose steam. Another one we like to look at is just the labor market. This has worked in prior cycles, and we think it's going to work again. And it's just to look at where the unemployment rate is relative to kind of the equilibrium unemployment rate. And so, when you're under that equilibrium, you tend to be generating a lot of tension in the economy, tension in the labor market. Wages start going up, and that creates that wedge for the Fed to start raising rates. So, when we look historically at other cycles, it tends to be that once the unemployment rate moves roughly 30 or even 50 basis points higher, that is almost a slam-dunk type indicator to say [that] the economy, and the labor market specifically, is losing momentum. And it doesn't happen that it just moves higher and then kind of moves back lower because the Fed's lowering rates, let's say, in response. It tends to be that it moves and it keeps on moving, and you're going into that recession area. Will McKenna: It gains momentum. Yeah. Jared Franz: It gains momentum in that recessionary condition. So, those are a couple that we're monitoring. There's also financial indicators like the yield curve that we think are important. They have tended to be important historically. We think they're important again. And so, we take that all together, and it's not one, two or three that we're watching, but it's kind of this mosaic of indicators to say, "OK, why is this happening? And what does it tell us about the type of recession or even the timing of the recession?" Will McKenna: Got it. So maybe … the way we wrote it in here is, "The inverted yield curve sounds like an elaborate gymnastics routine." But to the uninitiated, I know we had the two fives invert briefly, relatively recently, but I guess the two 10s is the more typical signal. Darrell, can you give us, first, “The Inverted Yield Curve for Dummies,” and then where you guys see us on that dimension? Will McKenna: And why that’s been such a reliable signal. Darrell Spence: Very simply put, the inverted yield curve is when long-term interest rates are lower than short-term interest rates or short-term interest rates are higher than long-term interest rates, which is not normally the case, because you tend to get paid a little bit more for lending money over longer periods of time. And the reason that comes about is because the bond market gets scared about something and starts to anticipate a Fed easing cycle. Conversely, but similarly, the Fed tightens too much, at least according to the bond market, and you get the short end of the curve yielding more than the longer end of the curve under the expectation that eventually the shorter rates will ultimately come down. There's a legitimate argument about whether it's a reflection of something else or an actual cause of a recession. And the reason it might be a cause of a recession is, you can think if you were a bank and you pay your depositors in short-term interest rates and you collect longer term interest rates on your loans, obviously having the shorter number be higher than the longer number isn't good for your profit margins. That starts to put a crimp on lending, which ultimately leads to a contraction in growth. Jared Franz: If you look at what the yield curve does over a cycle, it typically steepens, and then it flattens, and then it inverts. And what we've done is take the yield curve and just map it over our own indicators of where we are early, mid- and late cycle. And it ends up being really whacky that they’re almost perfectly correlated. Jared Franz: So, what the yield curve is telling you is that you're late in the cycle. What our economic indicators are telling you is that you're late in the cycle. So, they're kind of saying the same thing. And we think it's not unusual, it wouldn't be unusual, for the yield curve to have an inversion in the next year or two if we're right on our recessionary time frame. Darrell Spence: The inversion of the yield curve that got so much attention recently was just this small smidge right in the middle of it. Everyone has gotten so focused on the yield curve that inversion at any point along the curve generated a lot of excitement. But the reality is, it's generally the long versus the short end that needs to invert to cause a recession signal, and that hasn't happened yet. And even when it does happen, the time between that inversion and the ultimate start of a recession is pretty varied. I think it ranges anywhere from a couple of months to almost as long as two years. We have another framework that we've looked at that, I think, is somewhat interesting. And that is, monetary policy becomes tight when the fed funds rate or the target rate rises above the low that the long rate reached over the course of the prior cycle. That low was roughly 2%, a little bit below, so when the fed funds rate broke above 2%, that is the point that we could start to feel that monetary policy was getting tight. And the reason for that is twofold. One, as rates are rising, and if long rates are rising during a Fed tightening cycle, which is normally what happens, borrowers can still roll down the curve. They're taking more duration risk, but they can still take advantage of lower rates by shortening the duration of their borrowing. Once short rates get above the low that long rates ever hit, that option is completely gone. And similarly, on the lending side, banks tend to pay short rates, but their longer term assets are yielding that rate that was locked in over the course of the cycle. And so, their cost and their income stream starts to move adversely, and they become a little bit more reluctant to lend. So, borrowers lose some borrowing options, lenders become a little bit more reluctant to lend, and that's the point at which monetary policy starts to bite the economy. You know, we've hit that. But again, the time between hitting that criterion and ultimately a recession can be pretty varied, but we do know that once we've hit it, we've ultimately always had a recession. Will McKenna: Right. Let me come back to this discussion of the Fed. We touched on it at various points during the discussion. Clearly, there's been some different signals from the Fed recently, but where do we stand today? Where do you guys see us going from here in terms of the rising rate cycle? Are we pausing? Are we continuing? Darrell Spence: I don't think they're done, personally. And I think that is a function of analyzing where we think the economy is, the levels of resource utilization that are occurring — whether it be on the labor side or on the capacity utilization side — and the belief that we think inflation will move higher. We don't think it's going to be a big inflation problem or an inflation blowout, but most measures of core inflation are just about what the Fed says their target is: 2%. There's probably some willingness to let it drift above 2%. If the economy continues along the track that it's on, it'll probably continue to drift higher above 2%. Now, where that becomes uncomfortable enough for them to start to re‑initiate higher rates, it's hard to know. But we think those fundamentals are going to continue as we go through 2019. And so, as we get into the second half of the year, the unemployment rate might be lower than it is right now, inflation continuing to tick higher, we think the Fed will probably be back into a tightening cycle. I think the market has somewhat misinterpreted what they've been saying. I think the market has interpreted “data dependent” as done, and we think “data dependent” means data dependent, and they're going to wait and see what the economy throws at them to decide what they're going to do next. And the market has essentially priced out any more Fed tightening over the course of this entire cycle. We think maybe that's a little optimistic, again, given the developments that we see both as it relates to their dual mandates of low unemployment and stable inflation. Will McKenna: Joyce, as a stock picker, how do you think about what the Fed is up to? How closely did you watch that? I mean, where are you in this debate, and how do you see it unfolding relative to what you're trying to achieve? Joyce Gordon: Right. I was pretty nervous about what they were doing, going into late last year, with quite a few increases coming. And I thought that it was going to bring about the next recession at some point sooner rather than later. And given that they've backed off it a little bit and are slowing down, to me it probably means that the recovery can last a little bit longer. I agree with Darrell that they're not done, and it will be data dependent, and so they probably will come back. But I think, for now, it's kind of eased off the pressure. So, I'm not doing anything too much differently in my portfolio. Will McKenna: Excellent. Let me wrap it up and maybe just hear some kind of summary thoughts from each of you. We've talked a lot about recessions, different parts of the cycle. Kind of sum up your views on this topic, any other insights that occur to you. Jared Franz: Yeah. I think, at least from my end, like we said at the beginning, recessions are not common. We're usually in expansion. And as we think about the fundamentals of the economy, the U.S. economy, for the medium and long term over the next decade or two, I think it's important to remember, really, that the fundamentals are perhaps the best of developed economies, and maybe even among young economies, too. That we have a great innovation and technological system in place — the Googles and Microsofts and Amazons that we produce here — unlike many other countries. Even though our population growth rate is slowing a bit, it still is pretty rocking relative to a lot of other countries’, especially developed-market economies. So, when I take those couple things and say, “Well, look, we're going to go into recession eventually; it's going to hurt a little bit. But, you know, we're going to come out of this in better shape,” I think, than we are during the recession. Darrell Spence: I guess I would echo a lot of what Jared says. And I would also note that none of this is new. I mean, the whole process that we talked about — about imbalances building and economies becoming tight and late cycle and human behavior creating more imbalances. Will McKenna: Just a natural part of the cycle. Darrell Spence: The characters may change, but the storyline is exactly the same and ultimately we get through. And I think one of the things that the U.S. does have going for it is its flexibility. Earlier in this conversation, Jared alluded to “the banks take the losses, companies go out of business.” That's not to say that it is not painful; it's very painful for those who are involved and those who are exposed to it. But ultimately, the economy comes out much healthier than it was when it went in, and you can see around the world other areas that haven't necessarily taken that short-term pain to correct the imbalances and to let the survivors survive and the ones that are less healthy go. It's less painful in the short run, but ultimately they pay a very large price for that in terms of lost growth, lost output, lost opportunity over the longer term. So, we don't know if it's going to be 2020 or 2021. We pretty much know that it will happen at some point, simply because that's the nature of the U.S. economy. It's allowed to expand perhaps beyond its potential, and then ultimately, it has to contract back down to its potential — and then we're off again. But at the end of the day, that seems to be — as hard as it is to believe — that boom/bust cycle can ultimately serve the longer term outlook much better than trying to suppress or avoid it entirely. Will McKenna: Great. Joyce, what about from you? Joyce Gordon: Just the longer we get in this economic recovery, the more attention that we pay to dividend sustainability and all the details and making sure that the companies are on the right path. And that we think that there is some room for appreciation if the recession comes later than sooner. And also, on the fixed income part of it, not all fixed income instruments are created equal. At this point in the cycle, what becomes interesting is maybe some of the Treasury bonds that give you a lot of credit protection, and probably the shorter term in nature [bonds], where you're not taking a lot of interest rate risk. And then, later on, when we start coming out of said recession — if we ever get it — then you start thinking about higher yield opportunities that are more racy. But at this point in the cycle, no. Will McKenna: So, so lower your risk profile in your bonds. Will McKenna: — to dampen that volatility, and then maybe take on more credit risk later when it turns. Well, that was fantastic. Thank you so much. It’s been an incredibly informative and engaging conversation. Thanks again to Darrell, Jared, and Joyce for sharing your views on this important topic with our audience. 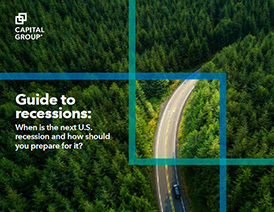 As a reminder to our U.S.-based audience, if you found today's discussion helpful, you can download our Guide to Recessions e-book using the link below on your screen, or go to guidetorecessions.com. And again, the guide itself is available for CE credit. So, thanks for joining us on Capital Ideas, and enjoy the rest of your day.